Raw Color, the Eindhoven-based studio of Christoph Brach and Daniera ter Haar, explores the materiality of color through research and experiments that cross disciplines. 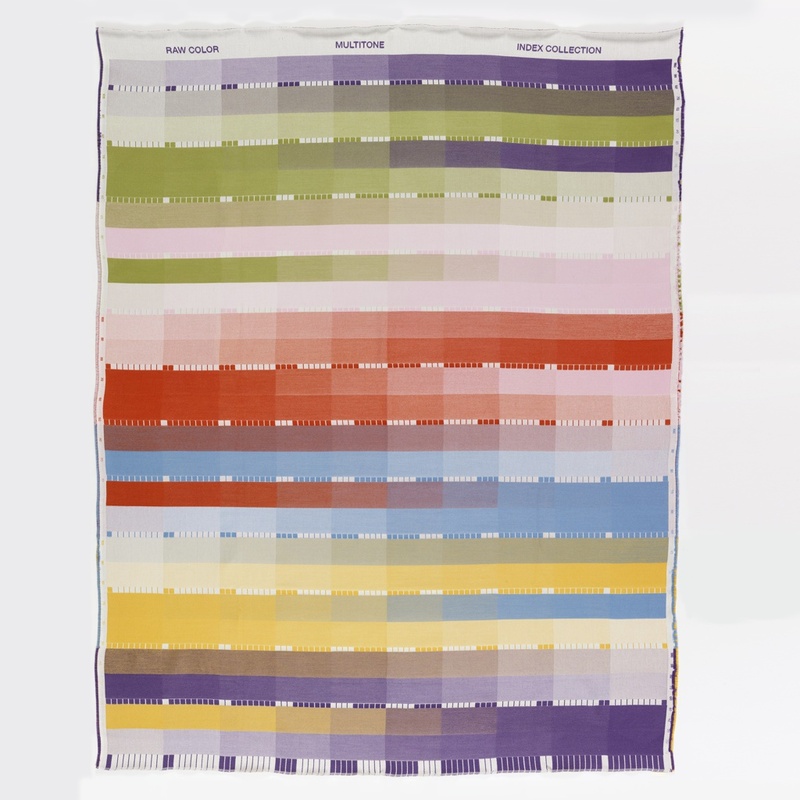 In 2012, Raw Color was invited to collaborate with TextielLab, a studio for experimentation with state of the art knitting and weaving technologies based at the Textiel Museum in Tilburg, The Netherlands. The lab regularly invites designers working in a variety of fields to conduct research using these machines, and to explore new capabilities. The designers had already initiated a series of experiments with color, including examining the impact of a color’s physical state on perception, considering the impact of form on color, and exploring the phenomenon of optical mixing through the use of paper shredders. Working with the team at Tilburg, they created a series of tea towels and blankets that express concepts from graphic design in woven form. In terms of both technology and terminology, there is surprisingly little overlap between print and weaving. The Index Collection uses a series of boxes similar to the screen keys seen on the sides of printed fabrics to express a gradually increasing intensity or saturation of color, from 10% to 100%. In the case of weaving, this variation in color saturation is created by altering the weave structure, from the reverse to the face of satin weave through a series of twill weaves. Each construction brings more colored yarn to the surface. The blanket also shows duotone and multitone color blending. Susan Brown is Associate Curator in the Textiles Department, Cooper Hewitt, Smithsonian Design Museum.